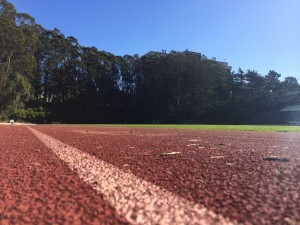 Yesterday’s rain did not prevent many of San Francisco Track and Field Club members from coming to the team practice this morning. And what a beautiful morning it was! Great seeing you everyone. After the practice, Board of Directors met for the first time this year and discussed various issues regarding Gay Games 9 and potentially hiring a coach, among other issues. This year’s board is committed to and focused on building a great team for GG9. It’s been working with the Sports Director for GG9 and it’s starting to create a budget for things and events that can help send a great team and allow us to have a great time while we are there. So, if you think of something the board can do for the team, please let the board members know in the next few weeks. Schedule change for 5,000m run – Rich Thoman reports GG9 organization has moved 5,000m run from Monday morning to Wednesday morning to accommodate 10K road race on Monday evening. If you are signed up for 5,000m run, you should be receiving an email from the organizer about the change. Please note both 5K and 10K road races are held outside Akron, if you are planning to participate in both track and road races. For GG9 track and field schedule, please see our GG9 track and field schedule page. UC Berkeley all-comers meet – The first UC Berkeley all-comers meet will be held next Saturday, Jan 18. For details, please see our event page. GG9 team code – When you sign up for a relay event, you will be asked for a team code. This team code can be created by anyone who is registering for track and field. If you already have a relay team set up, one of the relay members should create a team code online and provide it to the rest of the team.